Let me come on with an attitude and say I’ll debunk a myth today. Inspired once again by our baby daughter Miru, I started questioning the common belief that babies don’t share. A quick look-up on the BrinPage machine confirmed that this is indeed what our experts think. Fair enough, but what about tribal people wh o seem to share the fruit of their land as a matter of course, naturally, people who haven’t developed the conceptual tokenry of Western grammar to express the concept of “I” am sharing “this” with “you”. And what about animals? 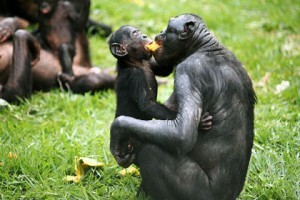 Bonobo’s have been observed to share food with strangers. So, what if sharing doesn’t really depend on the ability to “understand the concept”? What if it lies deeper within us, and the assumption that the need to master a highly sophisticated conceptual framework in order to share, is so obviously preposterous that we don’t even notice. Of course sharing is the most natural thing to do. From an evolutionary perspective, sharing has many advantages, from simple group survival to social bonding. I’m sure there have been many thinkers before me, who played with the same idea, but it’s too late to look them up now. We need to learn from the cute bonobo’s and immediately acquire their innate kindness to strangers, because it will be a crucial tool in the near future for the survival of our bipedal primate species. Besides, it’s almost 5am. Does it matter? Come on, what if we just share in silence, and develop those concepts post hoc, when some journalist with some sense of style wishes to write about it? We, as humanity, had a rough childhood full of violence. We were killing each other even before we had a concept of self and other. When we grew up, we developed all the concepts we liked, and with them, we could “prove” human nature to be whatever we liked. Hurrah! Which concepts have survived the longest, which notions had the strongest impact, or: which grammar does best support the dominant economic system? There you go. Baby’s don’t share. Because you need a concept for that. And we need the concept of concepts to tell ourselves that human nature is whatever we find convenient.